For other people with the same name, see Robert McGregor (disambiguation). Robert Roy MacGregor (Scottish Gaelic: Raibeart Ruadh MacGriogair; baptised 7 March 1671 – died 28 December 1734) was a Scottish outlaw, who later became a folk hero. Rob Roy was born at Glengyle, at the head of Loch Katrine, as recorded in the baptismal register of Buchanan, Stirling. His parents were Donald Glas MacGregor and Margaret Campbell. He was also descended from the Macdonalds of Keppoch through his paternal grandmother. Along with many Highland clansmen, at the age of eighteen Rob Roy together with his father joined the Jacobite rising of 1689 led by John Graham, 1st Viscount Dundee, known as Bonnie Dundee, to support the Stuart King James II who had fled Britain during the Glorious Revolution of 1688. Although victorious in initial battles, Dundee was killed in 1689, deflating the rebellion. Rob's father was taken to jail, where he was held on treason charges for two years. Rob's mother Margaret's health failed during Donald's time in prison. By the time Donald was finally released, his wife was dead. The Gregor chief never returned to his former spirit or health. Grave site of Rob Roy MacGregor, marking his wife (Helen) Mary, and sons Coll and Robert (Balquhidder). In 1716 Rob Roy moved to Glen Shira for a short time and lived under the protection of John Campbell, 2nd Duke of Argyll also known as Red John of the Battles, "Iain Ruaidh nan Cath." Argyll negotiated an amnesty and protection for Rob and granted him permission to build a house in the Glen for the surrendering up of weapons. "Traditionally the story goes that Argyll only received a large cache of rusty old weapons." A sporran and dirk handle which belonged to Rob Roy can still be seen at Inveraray Castle. Rob Roy only used this house occasionally for the next three or four years. In July 1717, Rob Roy and the whole of the Clan Gregor were specifically excluded from the benefits of the Indemnity Act 1717 which had the effect of pardoning all others who took part in the Jacobite rising of 1715. 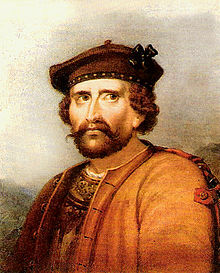 Despite many claims to the contrary, Rob Roy was not wounded at the Battle of Glen Shiel in 1719, in which a British Government army with allied Highlanders defeated a force of Jacobite Scots supported by the Spanish. However, two of the Jacobite commanders, Lord George Murray and the 5th Earl of Seaforth, were badly wounded. Robert Roy MacGregor is claimed in many accounts to have been wounded, but the actual text of Ormonde's account of the battle has the following - "Finding himself hard-pressed, Lord Seaforth sent for further support. A reinforcement under Rob Roy went to his aid, but before it reached him the greater part of his men had given way, and he himself had been severely wounded in the arm." Note that this does not state that Rob Roy was wounded, but Seaforth. Sometime around 1720 and after the heat of Rob's involvement at the Battle of Glen Shiel had died down, Rob moved to Monachyle Tuarach by Loch Doine and sometime before 1722 Rob finally moved to Inverlochlarig Beag on the Braes of Balquhidder. Rob Roy became a respected cattleman—this was a time when cattle rustling and selling protection against theft were commonplace means of earning a living. Rob Roy borrowed a large sum to increase his own cattle herd, but owing to the disappearance of his chief herder, who was entrusted with the money to bring the cattle back, Rob Roy lost his money and cattle, and defaulted on his loan. As a result, he was branded an outlaw, and his wife and family were evicted from their house at Inversnaid, which was then burned down. After his principal creditor, James Graham, 1st Duke of Montrose seized his lands, Rob Roy waged a private blood feud against the Duke until 1722, when he was forced to surrender. Later imprisoned, he was finally pardoned in 1727. He died in his house at Inverlochlarig Beg, Balquhidder, on 28 December 1734, aged 63. Another version of this series of events states that Rob Roy's estates of Craigrostan and Ardess were forfeited for his part in the rebellion of 1715. The Duke of Montrose acquired the property in 1720 by open purchase from the Commissioners of Enquiry. K. Macleay, M.D., in Historical Memoirs of Rob Roy and the Clan MacGregor quotes, "but he had taken the resolution of becoming a Roman Catholic, and he accordingly left the lonely residence we have described, and returning to Perthshire, went to a Mr. Alexander Drummond, an old priest of that faith, who resided at Drummond Castle." Macleay takes the view that Rob did this out of sorrow for his crimes. Glengyle House, on the shore of Loch Katrine, dates back to the early 18th century, with a porch dated to 1707, and is built on the site of the 17th century stone cottage where Rob Roy is said to have been born. Since the 1930s, the Category B-listed building had been in the hands of successive water authorities, but was identified as surplus to requirements and put up for auction in November 2004, despite objections from the Scottish National Party. The Rob Roy Way, a long distance footpath from Drymen to Pitlochry, was created in 2002 and named in Rob Roy's honour. Descendants of Rob Roy settled around McGregor, Iowa, United States, and in 1849 it was reported that the original MacGregor seal and signet was owned by Alex McGregor of Iowa. The Scots Gaelic clan seal was inscribed "S' Rioghal Mo Dhream " ("Royal is my race"). The signet was a bloodstone from Loch Lomond, and was sketched by William Williams. In 1878, the football club Kirkintilloch Rob Roy was founded and named in his memory. Rob Roy on the Rock, a statue located on the spot where Rob Roy leapt across the Culter Burn, Peterculter, Aberdeen while on the run from Montrose's men. Adaptations of his story have also been told in film including the silent film Rob Roy (1922), a film from Walt Disney Productions Rob Roy, the Highland Rogue (1953) and the Rob Roy (1995) directed by Michael Caton-Jones and starring Liam Neeson as the title character. The film was shot entirely on location in the Scottish Highlands. In 1894, a bartender at the Waldorf Hotel in New York City created the Rob Roy cocktail in honour of the premiere of Rob Roy, an operetta by composer Reginald De Koven and lyricist Harry B. Smith loosely based upon Robert Roy MacGregor. In 2017 a new statue of Rob Roy was commissioned to be installed in Peterculter, Aberdeen. The artist appointed was David J Mitchell, a graduate of Grays School of Art in Aberdeen. ^ Carol Kyros Walker (1997). Recollections of a Tour Made in Scotland by Dorothy Wordsworth. Yale University Press. See Appendix 5. ^ Sir James Balfour Paul, LLD, ed. (1909). The Scots Peerage, Vol 6. Edinburgh: David Douglas. p. 273. ^ Major William Williams' Journal (Annals of Iowa, Volume XII, No. 4, 3rd Series). Historical Department of Iowa (Edgar R. Harlan, Curator). April 1920. p. 257. Retrieved January 29, 2012. ^ "Rob Roy Statue - Rob Roy On The Rock". ^ English Short-Title Catalogue T109114. Earlier attributions to Daniel Defoe are not accepted today on stylistic grounds; see The New Cambridge Bibliography of English Literature II 902 and John Robert Moore, A Checklist of the Writings of Daniel Defoe. 2d edition. [Hamden, Connecticut]: Archon Books, 1971. ^ The Highland rogue: or, the memorable actions of the celebrated Robert Mac-gregor, commonly called Rob-Roy. nls.uk. Retrieved March 10, 2018. ^ Andrews, Sudhir (2008). Textbook of Food & Beverage Management. Tata McGraw-Hill. p. 248. ISBN 978-0-07-065573-7. Nigel Tranter (1991). Rob Roy MacGregor. New York: Barnes and Noble. ISBN 1-897784-31-7 (2005 reprint). Rob Roy MacGregor, His Life and Times, by W. H. Murray; Published by Canongate books Ltd 3ed ed 1996. Wikimedia Commons has media related to Robert Roy MacGregor. The MacGregor trilogy, by Nigel Tranter, Hodder & Stoughton, 1989. MacGregor's Gathering, 1706–1708. The Clansman, 1711–1716. Gold for Prince Charlie, 1743–1746. "Robert 'Rob Roy' MacGregor: outlaw and folk hero", by Brendan O'Brien, from Scotsman.com, 27 Jan 2005. "Glengyle House. Built by Rob Roy MacGregor". Retrieved 2010-09-17.